Home » Troubadour and page in the 13th century. 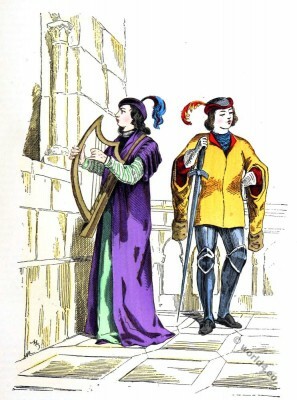 Page et Troubadour au XIIIe siècle. As troubadour is called the poet, composer and singer of courtly medieval songs, especially the written in Occitan troubadour poetry of southern France. The time of the troubadours is especially the high medieval 12th and 13th centuries. Significant troubadours were among others Wilhelm IX. Duke of Aquitaine, Jaufré Rudel, Cercamon, Alfonso II. Of Aragon, Peire de Corbian. Ménestrels even Ménétriers or minstrels were in the Middle Ages of old Provencal juggler, propelled and musicians. In part they were servants of troubadours, who took over the presentation and dissemination of songs for these. As bards and minstrels they had the same status as the lower house and kitchen staff. A court singer is described as someone who can speak well and rhyme, knows the story of Troy, balancing apples on pinches, juggle and can jump through hoops. French medieval male dress in the 13th century. Medieval costume history in Germany. 11th to 13th century. The influence of the Crusaders to the French clothing. This entry was posted in 13th Century, Burgundian dress, France, Middle Ages and tagged Burgundian fashion period, Costumes civils et militaires des Français, Gothic costumes, Medieval costume on 6/19/15 by world4.